Conducted emissions are electromagnetic disturbances caused by a device and conducted out by interconnects such as the power supply lines. Devices are required to pass stringent limits on the level of such emissions and these tests require expensive testing time at compliance laboratories. This video shows how the powerful spectrum analysis features in the R&S®RTO oscilloscope can be used to verify conducted emission levels relative to the requirements during development thereby ensuring passing results in the compliance laboratory. Meeting EMI and EMC requirements is critical to bringing electronic products to market. Compliance testing requires expensive equipment and test time at a compliance laboratory. Failures found late impact project costs and launch schedule due to debugging and re-testing. 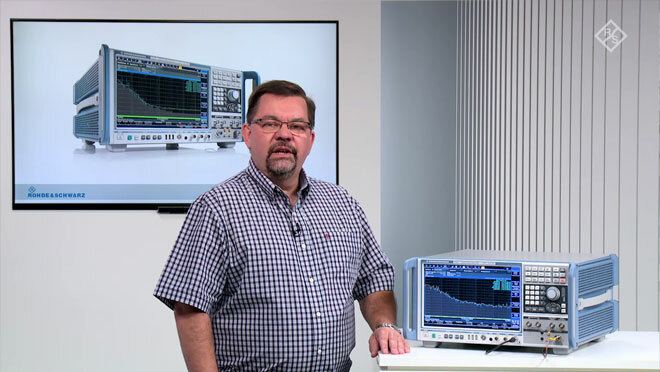 This video shows how the R&S®RTO oscilloscope can be used with a near field probe to find and fix EMI issues quickly and reliably during the development at the R&D lab thereby minimizing expensive re-testing and shortening time to market. Measuring small currents has become increasingly important for battery powered portable and wearable consumer devices, IoT and medical applications. Designers of these devices must measure currents from the sub-milliampere up to the ampere range. The R&S®RTE and R&S®RTO oscilloscopes can measure currents down to 100 uA using their low noise and high-sensitivity current probe. This video demonstrates how to efficiently and accurately measure signal integrity on differential transmission structures or balanced lines with the four-port R&S®ZNB vector network analyzer from Rohde & Schwarz. The R&S®ZNB in combination with the R&S®ZN-Z84 switch matrix enables straight-forward differential measurements in the time domain on multiple differential structures including rise time, differential impedance, intra-pair skew time and inter-pair skew time. High sensitivity, multifunctionality and a great price – that is what makes the R&S®HMO1002 and R&S®HMO1202 digital oscilloscopes so special. From embedded developers to service technicians to educators – the wide range of functions address a broad group of users. One, two or three channels – R&S®HMC804x power supplies with their specifications and wide range of functions are ideal for use in development labs and industrial environments. The new R&S®RTO-K21 USB 2.0 Compliance Test software is an automated test solution according to the USB-IF test specification to address the testing of USB Device, Host and Hub applications at the various speed modes High-speed (USB specification 2.0: 480 Mbps), Full-speed (USB 1.1: 12 Mbps) and Low-speed (USB 1.0: 1.5 Mbps). Serial high-speed data interfaces such as USB 2.0, LVDS, HDMI or PCI-e require a special approach for jitter measurements as they use an embedded clock signal as time reference. Clock data recovery is required to extract the frequency and phase information of the embedded clock out of the data signal. The R&S®RTO digital oscilloscope with option R&S®RTO-K13 performs clock data recovery in hardware and real-time. This enables triggering on the embedded clock as well as fast histogram and eye mask testing on high-speed serial data signals with embedded clock. Jitter measurements are required for characterization and debugging of fast clock and data signals. This is commonly referred to as "signal integrity" testing. Clock signals and data signals as part of parallel and serial interfaces are widespread in almost any electronic design. The jitter wizard of the R&S®RTO digital oscilloscope guides the user step-by-step through the configuration of the oscilloscope to perform common jitter measurements such as period and frequency, TIE, cycle-to-cycle jitter, and skew.